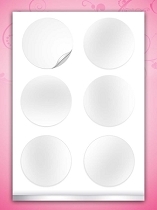 Supreme Icing sheets in this pack have 12 pre-cut 2.5 inch circles. 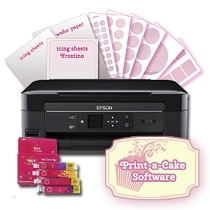 Perfect for those cupcakes, cookies, or even yummy macarons! 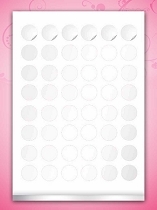 This pack contains 24 sheets giving you a total of 288 pr cut circles! 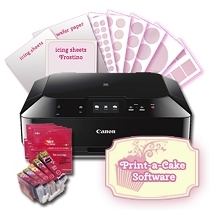 To print worry free we recommend our Print a Cake software all templates built in! NOTE: Icing sheets cannot be stored in extreme heat or cold conditions. Room temperature is highly recommended! Q: In yeas pst I used a company to print some edible images for me. It was not on wafer paper and did not have to be hand cut. We used a heat source to loosen the images from a sheet. The company no longer prints but I need those type labels. Is this item like that? 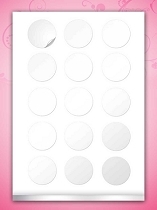 Q: how do I know that the picture will line up perfectly with the circles when printing? Q: How far in advance of serving can you put the sheets on the cookies, cakes, etc? A: Best way to do is few hours before serving ... or 24 hours .., however printed sheet in ziplock bag can be stored for months..
Q: I'm interested in buying the 25 Supreme Circle Sheets - 2.5" diameter Edible sheet,I need to print 500 logos, is there a site that we can download the template that will match the sheet when we print it? Thanks. A: Here is link for software that is built in template for 2.5 circle sheet..
Q: I ordered supreme circle sheets-2.5 diameter and the first time I ordered it was a KopyCake product-On my second time ordering I received a different type sheet and it is not lining up correctly on my printer?. Please offer suggestions as to how I can address this. Hopefully I have the right product-I have a larger order to produce? A: We don't sell Kopykake products , therefore you purchased those sheets somewhere else . 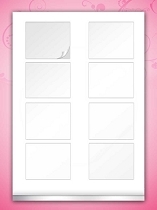 We have our own templates available for download in your confirmation email after purchase is made . 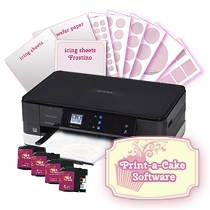 We also going to introduce our new software Print -a- Cake soon . 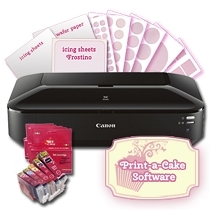 Program will have built in templates for printing all our pre cut sheets. Supreme Icing Sheets Rectangles - 2.5X3"